There are various methods available for the evaluation of skin color. Nevertheless, visual assessment remains one of the gold standards. There are sophisticated instruments for providing objective measurements and these are reliable and have been proven as valid for the evaluation of skin color. Multiple studies have used reflectance spectroscopy for objective measurement of skin color. , Two types of skin reflectance spectrophotometers have been used to determine skin color: A tristimulus reflectance colorimeter such as the Minolta Chromameter (using the Commission International d'Eclairage (CIE) lab system) and a narrowband reflectance spectrophotometers such as the Mexameter (using erythematic and melanin indices). However, these instruments are expensive and inconvenient for clinical use. Rating scales, the subjective evaluation such as a physician's global assessment, and visual hyperpigmentation scale are convenient and inexpensive tools. Until date, many visual hyperpigmentation scales were developed to reduce potential inter-observational variability. Taylor et al., developed the Taylor hyperpigmentation scale for providing an inexpensive and convenient method for the assessment of skin color and for improvement of pigmentation following therapy. The investigators rated the Taylor hyperpigmentation scale as a useful and easy tool to use and 60% of the investigators stated they would use it in their clinical practice. The Felix von Luschan skin color chart is another tool available and grants anyone the right to use it for any purpose deemed [Figure 1]. These tools are ideal, readily available, inexpensive, and convenient for use in dermatology clinics. However, the correlation between skin color charts and objective measurements have not been evaluated. The purpose of this study was to assess the correlation between skin color evaluation by using a skin color chart (Felix von Luschan skin color chart) and a narrowband reflectance spectrophotometer (Mexameter MX18). The participants consisted of volunteers who work in Her Royal Highness (HRH) Princess Maha Chakri Sirindhorn Medical Center. The exclusion criteria included tattoos on the evaluated regions, any known skin diseases, or pigment skin disorders in the specified areas. Demographic data included the subjects' age and gender. In addition, the Fitzpatrick skin photo types were recorded for each subject. This study has been reviewed and approved by the appropriate institutional review boards and ethics committee of the HRH Princess Maha Chakri Sirindhorn Medical Center. All participants had provided letters of consent prior to engaging in this study. This study used two skin color evaluation tools. The first tool was the Felix von Luschan skin color chart in which skin color ranged from 1 to 36 (1 corresponds with light skin and 36 corresponds with dark skin) with the intra-rater (r = 0.984) and inter-rater reliability (r = 0.964) evaluated. The second instrument was a narrowband reflectance spectrophotometer (Mexameter MX18). The Mexameter MX18 (Courage and Khazaka Electronic, Cologne, Germany) was used to assess the skin color based on the content of melanin and hemoglobin in the skin, which is expressed as Erythema (E) and Melanin (M) indices. This instrument uses the absorption and reflection principles from light emission (green; 568 nm, red; 660 nm, infrared; 880 nm) and a receiver to measure the light as reflected by the skin. For the melanin measurement, wavelengths of 660 nm and 880 nm were used. The erythematic index was measured by two different wavelengths: 568 nm and 660 nm. The results of the measurement of the E and M indices ranged from 0 to 999 (0 corresponds to white skin, 999 corresponds to black skin). The values of M, E, and M plus E indices from the Mexameter MX18 were used for analyses. Skin color of each participant was measured by a trained investigator on four different anatomical skin sites. These skin sites were at the midpoint between the elbow and the wrist on the medial aspect of the volar regions and the medial aspect of the dorsal regions of both forearms. A formally trained investigator scored the skin color using the Felix von Luschan skin color chart. In this study, a measurement of the skin color was assessed with the Mexameter MX18 and was taken by the same trained dermatologist under similar controlled condition, probe pressure, and shield against the ambient light. The average indices taken from the Mexameter MX18 were then carried out with repeated measurements, four times on the indicated reference points. In addition, another trained investigator also classified the skin phototypes of all participants with the use of the Fitzpatrick skin phototypes criteria (skin phototype I: pale white skin, blue/hazel eyes, blond/red hair, always burns, does not tan; skin phototype II: fair skin, blue eyes, burn easily, tans poorly; skin phototype III: darker white skin, tans after initial burn; skin phototype IV: light brown skin, burns minimally, tans easily; skin phototype V: brown skin, rarely burns, tans darker easily; skin phototype VI: dark brown or black, never burns, always tans). The skin color evaluating method was determined as our protocol: In a room with fluorescent lighting, with no interfering outdoor sunlight, and at 20-30 min after enrollment. All data were analyzed by using SPSS version 11.5. The correlation between the two methods was analyzed using Pearson's Rank and was considered statistically significant at the value of P < 0.05. A total of 52 participants were enrolled in the study, and a sum total of 208 records were established. The average age of our subjects was 23.7 ± 5.7 years. Most of the participants were female (51.9%). The skin color scale numbers of the participants ranged from 14 to 33, most of them were scored at number 16 followed by scores of 15, 19, and 26 with the rates of 19.2%, 13.5%, 9.6%, and 9.6%, respectively. [Figure 2] summarizes the distribution of the percentages of the skin color scale numbers. Skin phototypes of the participants, using Fitzpatrick skin phototypes criteria, was scored as skin phototypes III, IV, and V at the rates of 71.2% (37/52), 23.1% (12/52), and 5.8% (3/52), respectively. The mean of the M, E, and M plus E indices were at 230.4 ± 74.4, 268.5 ± 73.2 and 498.9 ± 143.9 respectively. Evaluation the skin color with the Felix von Luschan skin color chart correlated closely with the results of testing with the Mexameter MX18. The correlation coefficient of the skin color scale number and each index; M, E and M plus E indices were at 0.90, 0.86 and 0.90 respectively with statistical significance of; P < 0.001 [Table 1]. The increment of the skin color scale numbers were congruent with an increase in each of the mean indices (mean M, mean E, and mean M plus E indices). The relationship of the Fitzpatrick skin phototype, the skin color scale numbers and the mean indices from the Mexameter MX18 are shown in [Table 2]. The study's findings show the consistency of skin color evaluation done with the Felix von Luschan skin color chart and the Mexameter MX18 with a high correlation coefficient. Although a skin color chart was a subjective assessment, it showed a significant correlation with an objective assessment tool. Therefore, the result from the study affirmed that these tools could apply in clinical practice, especially when used fastidiously by trained evaluator it could reduce the error of diagnosing problems related to skin pigmentation. In this study, Fitzpatrick skin phototype also correlates with the assessment with the Mexameter MX18 and use of the skin color scale chart. The increments of the skin phototype classification numbers were congruent with an increase of each skin color scale number and the mean indices obtained from the Mexameter MX18. However, in clinical use, each tool has been used differently in their objectives. Fitzpatrick skin phototype is composed of criteria for classifications such as sun burning, sun tanning responses, ethnicity, and hair and eye color, which provides a potential risk for skin cancer substantially more than the skin color assessment following treatment. Similarly, the skin color scale chart was practical for skin color assessment. Sampling may lead to some bias and limits generalization of the subjects. In our study, most of the participants were Fitzpatrick skin phototype class III-IV. Future research should include a study for interpersonal and intrapersonal variability of the skin color on the scale chart and the recruitment for all Fitzpatrick skin prototypes. In conclusion, skin color evaluation using a skin color scale chart correlates significantly with skin color evaluation done by a narrowband reflectance spectrophotometer. We would like to thank all participants. This research was supported by Faculty of Medicine, Srinakharinwirot University, Thailand. 1. Hajizadeh-Saffar M, Feather JW, Dawson JB. An investigation of factors affecting the accuracy of in vivo measurements of skin pigments by reflectance spectrophotometry. Phys Med Biol 1990;35:1301-15. 2. Lascari AD. Carotenemia. A review. Clin Pediatr (Phila) 1981;20:25-9. 3. Taylor S, Westerhof W, Im S, Lim J. Noninvasive techniques for the evaluation of skin color. J Am Acad Dermatol 2006;54:S282-90. 4. Pershing LK, Tirumala VP, Nelson JL, Corlett JL, Lin AG, Meyer LJ, et al. Reflectance spectrophotometer: The dermatologists′ sphygmomanometer for skin phototyping? J Invest Dermatol 2008;128:1633-40. 5. Clarys P, Alewaeters K, Lambrecht R, Barel AO. Skin color measurements: Comparison between three instruments: The Chromameter(R), the Derma Spectrometer(R) and the Mexameter(R). Skin Res Technol 2000;6:230-8. 6. Taylor SC, Arsonnaud S, Czernielewski J, Hyperpigmentation Scale Study Group. The Taylor Hyperpigmentation Scale: A new visual assessment tool for the evaluation of skin color and pigmentation. Cutis 2005;76:270-4. 7. Wilkipedia.org. San Francisco: Wikipedia Foundation, Inc; C 2003. 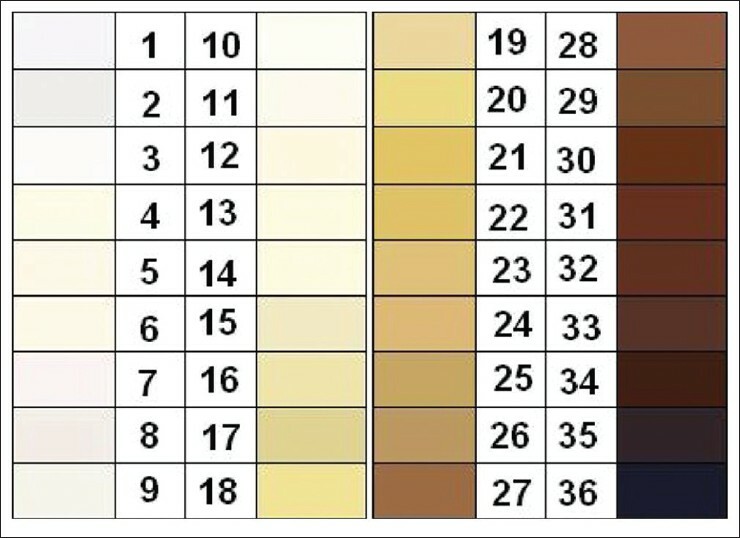 Available from: http://en.wikipedia.org/wiki/File:Felix_von_Luschan_Skin_Color_Chart.JPG [Last updated on 2006 Aug 27; Last cited on 2010 Mar 10] [Last accessed on March 10,2010]. 8. Sachdeva S. Fitzpatrick skin typing: Applications in dermatology. Indian J Dermatol Venereol Leprol 2009;75:93-6. 9. Puri N. A study of pathogenesis of acanthosis nigricans and its clinical implications. Indian J Dermatol 2011;56:678-83. 10. Kollias N. The physical basis of skin color and its evaluation. Clin Dermatol 1995;13:361-7. The study has shown a high correlation between skin color evaluation by a skin color scale chart and an objective assessment tool. The study also convinced that these tools could apply in clinical practice.